Wayne, NJ (January 8, 2009) -- Victor Company of Japan, Ltd. (JVC) further expands its ProHD camcorder line-up by introducing two professional solid state camcorders, the industry's first to store files in the native Quicktime format for Apple's Final Cut Pro™ onto reliable and inexpensive SDHC media cards. The compact hand-held GY-HM100 3-CCD camcorder is introduced in January 2009, while the compact shoulder GY-HM700 is scheduled for introduction in February 2009. Both camcorders record 35Mbps high definition video and uncompressed audio directly to inexpensive SDHC media cards in the native Quicktime format used by Apple Final Cut Pro™. The growing trend in the professional video market is to record directly from camera to solid state memory, and the current leading solutions have made the workflow quite expensive for most users, relying on proprietary media and file formats. In addition, compatibility with major non-linear editing (NLE) systems requires codec converting or re-wrapping format files, a process that significantly slows down the post production process. Professional users are yearning for a simple, fast solution that allows instant editing of recorded material without file conversion, and a media cost approaching the economy of tape. To meet this demand, JVC has adopted the Apple QuickTime file format for Final Cut Pro. 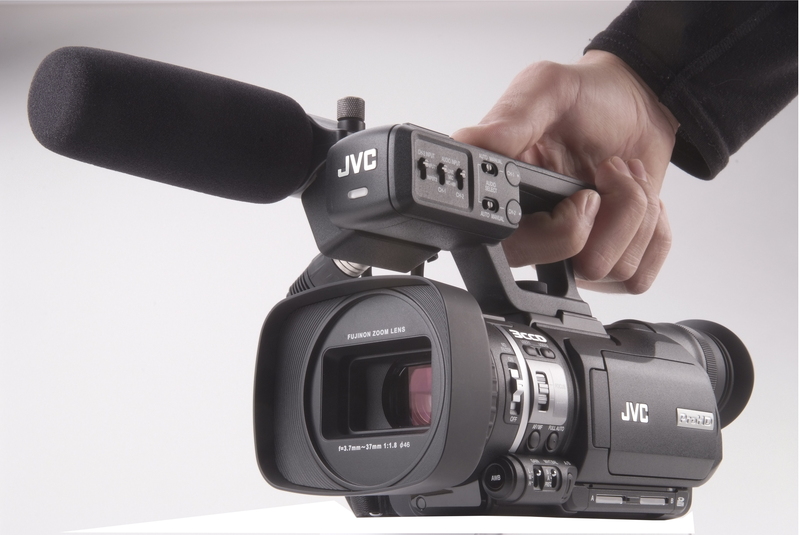 And, to keep media costs as low as possible, JVC selected the reliable yet inexpensive SDHC media card—one of the most widely-used solid state memory cards on the market today. “We are pleased to support a seamless experience for professional videographers working with Final Cut Studio 2,” said Hiroyuki Takekura, Managing Director of JVC's Professional Systems Division. “We expect that pro video users will find huge workflow benefits as this optimized workflow bridges the gap between production and post production tasks." Both camcorders natively record the file format used by Apple QuickTime for Final Cut Pro. Video clips are dragged directly from the storage media onto the non-linear editor's timeline, eliminating the need for transcoding that can consume excessive time and disk space while maintaining original first generation image quality. 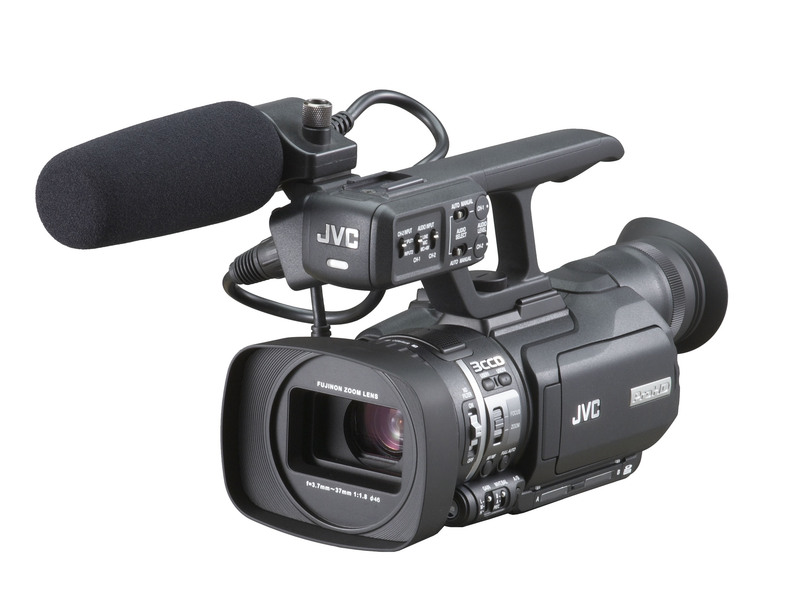 Drawing from its experience in developing encoders currently used in broadcast applications, JVC developed a proprietary codec capable of providing highly efficient compression up to 35 megabits per second, a bit rate supporting full 1920 x 1080 encoding in the HQ mode. This results in recorded images of extremely high quality. MPEG2 long GOP encoding is the most widely implemented broadcast standard compression and is currently supported by all popular editing systems and broadcast servers. Additionally, both cameras can record 720p (19/35Mbps) and 1080i (25Mbps) in SP mode, assuring compatibility with today’s most popular professional NLE systems. Both units record on widely available SDHC memory cards, presently available in capacities up to 32GB. The cameras provide 2 memory card slots, for a total of up to 64GB of on board storage—enough for up to 6 hours of continuous HD recording. The cameras automatically begin recording on the second card when the first card is full. Also, unlike other professional solid state media, the per-minute cost of SDHC memory is comparable to professional video tape. Moreover, SDHC media becomes the first practical solid state solution for physical archiving. The GY-HM100 is the smallest professional format 3-CCD camcorder available at about the size of a lens for a 2/3-inch imager camera. This makes it ideal for applications where a full size camera would be impractical, such as tight quarters and operating in potentially unsafe situations. For a smaller footprint and less conspicuous shooting, the handle can be easily removed and the audio can be recorded via the built-in 2-channel microphone. Three newly developed ¼-inch progressive scan CCDs provide rich, accurate colors. The red and blue pixel locations are spatially off-set relative to green, enabling the sampled luminance information to be significantly increased in both horizontal and vertical directions. This results in higher resolution images compared to prior CCD designs. To separate primary colors, JVC has incorporated a high quality - glass prism and a proprietary mounting technology. The GY-HM100U utilizes a high definition lens by Fujinon, a world leader in HD lens technology. This lens features three aspherical elements. In addition, the lens surface has a new Electronic Beam Coating (EBC) that greatly reduces degradation caused by light reflecting off the lens surfaces, leading to greater light transmission and reduced flaring and ghosting. To protect the lens, a flip-in cover is integrated in the lens hood, eliminating the need for an external cap. Focus is controlled manually or automatically. A smooth servo zoom is controlled with a conventional rocker on the handgrip, or manually with the lens ring. For close-up shooting, a macro mode allows for shooting subjects as little as 2-inches away from the lens. Exposure (iris) is manually or automatically controlled, allowing the shooter to adjust the depth of focus by selecting the appropriate F stop. In the manual iris mode, the current F stop value is displayed in the viewfinder. Despite its size, the camera's hand grip has an ergonomic shape, accommodating hands of all sizes. Control and switches are placed with professional users in mind. To conserve space, a single ring is used for both manual focus and manual zoom. Additional manual controls include white balance, shutter, gain, and audio levels. The GY-HM100 is scheduled for delivery in April 2009, with a list price under $4,000. The GY-HM700 is scheduled for delivery in March 2009. More details will be released in February 2009. 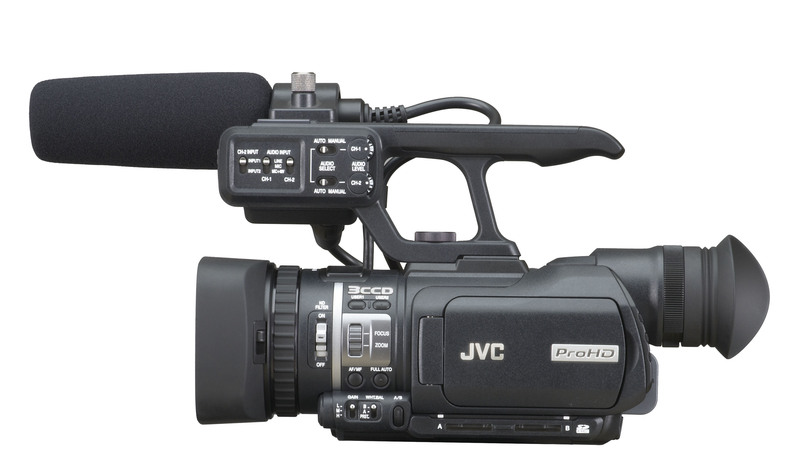 JVC Professional Products Company, located in Wayne, New Jersey, is a leading manufacturer and distributor of a complete line of broadcast and professional equipment. 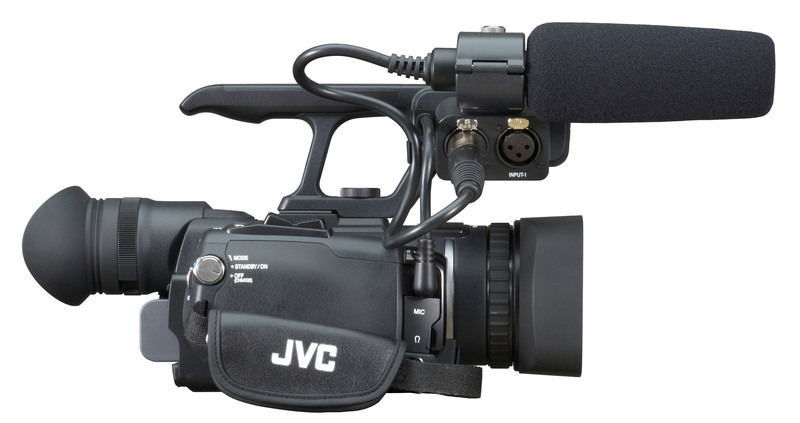 For more information about this, or any other JVC Professional Products Company product, contact JVC at (800) 582-5825; or Steven DeRosa at PFS Marketwyse 973-812-8883, ext. 259 or visit JVC’s Web site at http://www.jvc.com/pro. Apple and Final Cut Pro are trademarks of Apple Inc.